If you can see it, you can be it! Introduce your child to your role models with this series of inspirational board books. It's never too early to introduce your child to the people you admire! 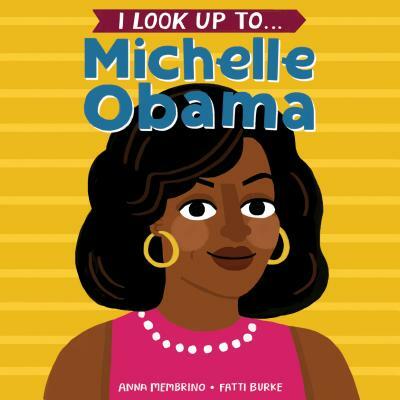 This board book distills Michelle Obama's excellent qualities into deliciously illustrated little baby-sized bites, with text designed to share and read aloud. Each spread highlights an important trait, and is enhanced by a quote from Michelle herself. Kids will grow up hearing the words of this influential woman and will learn what YOU value in a person! The I LOOK UP TO . . . series aims to shine a spotlight on women making a difference in the world today, and to encourage young kids to follow in their footsteps! ANNA MEMBRINO is an editor, writer, and ultimate frisbee player and coach. She currently lives in New York City. FATTI BURKE is an illustrator from County Waterford, Ireland, who currently lives in Amsterdam. She has been working as a freelance illustrator since she graduated from the National College of Art and Design in 2012 with a degree in Visual Communications. Her work revolves around the things she loves--food, home, memes, animals, and tradition.